Bacon lovers shouldn't settle for less than this traditional cast iron bacon press. Cast iron conducts heat evenly so bacon cooks on both sides. Press works fast, and flattens and helps to crisp bacon. Just season lightly before cooking for delicious bacon. Hand wash. 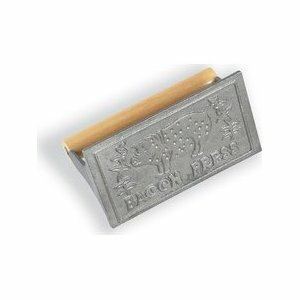 This bacon press is cast iron and has a wooden handle that is heat resistant. Use this steak weight to keep bacon flat, for hamburgers and hot dogs, and even grilled vegetables. Will keep bacon from curling and hamburger from shrinking. Measures 6-5/8" x 4" * Features a very cute pig design on the front.